This map (Scar of Northrend) was created for the third melee mapping contest : Melee Mapping contest #3 - 4 vs 4. The goal of this contest was to create a balanced,beautiful and creative 4v4 melee map without using any customized ressource. 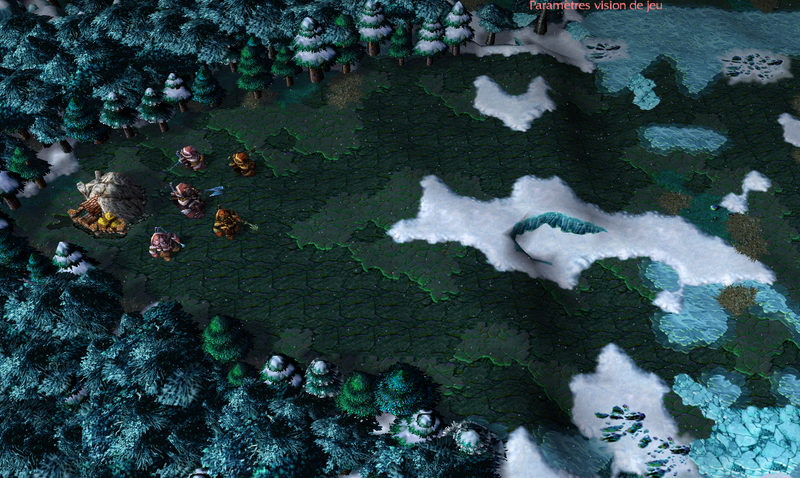 This last constraint was here to ensure that the map will still be playable on warcraft3 reforged. This map is a 4v4 melee map of size 179 by 180 with the land tile 'Northrend'. 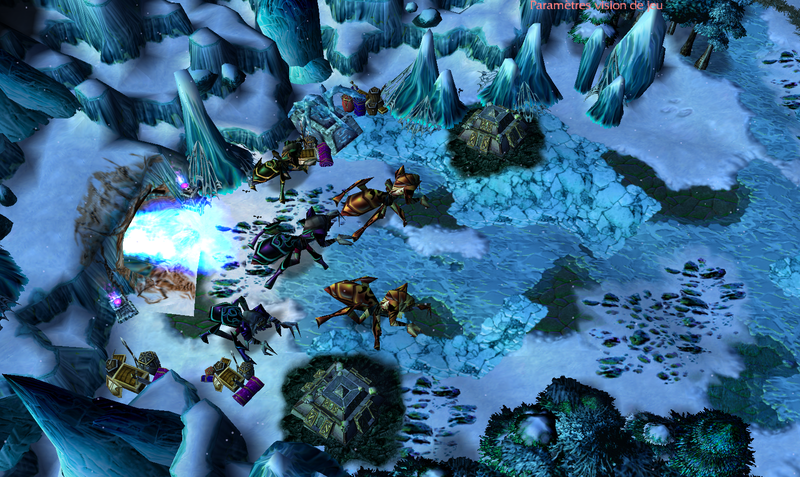 The two teams are starting on the left- or right-hand side of the map. In a team, the player are disposed in a diamond shape which deliberately lets one of the side of the diamond more exposed. Between the teams, there is a 'rift' which is easy to cross but gives you the low-ground disavantage. Every starting location gives high-ground advantage. The path in the middle of the map is wide open to allow rush and global fights. It gives direct access to the base of the player in front of the team. Alternatively, some 'narrow' pathway on the top and bottom of the map allow the players to get pass the center of the map and sneak into the other side of the map. These sideways are also the position of the two biggest goldmines of the map. Note that there is no consummable item of level 5 or above and no permanent item of level 7 or above. Starting location, with two ramps creating a large entrance to the high-ground of the base itself. Note that cutting the trees reveals to small side entrances. Two extremely large ramps are leading to the other side, passing close to the dragon nest in the middle of the map. On the top and bottom of the map, they are some sideway paths, which can be monitored from this highgrounds. The ramps and the edge of the cliff are unbuildable though, and a medium creep camp guard this point of view. In the corners, nerubians are creeping out of their caves. In between the bases of a team's side of the map, there are the naturals. The natural expansions that are closer to the ennemy are guarded by smaller creep camps than the 'protected' ones. All the natural expansions are also close to the taverns. Beginning of a 4v4 early fight, in the middle of the map. 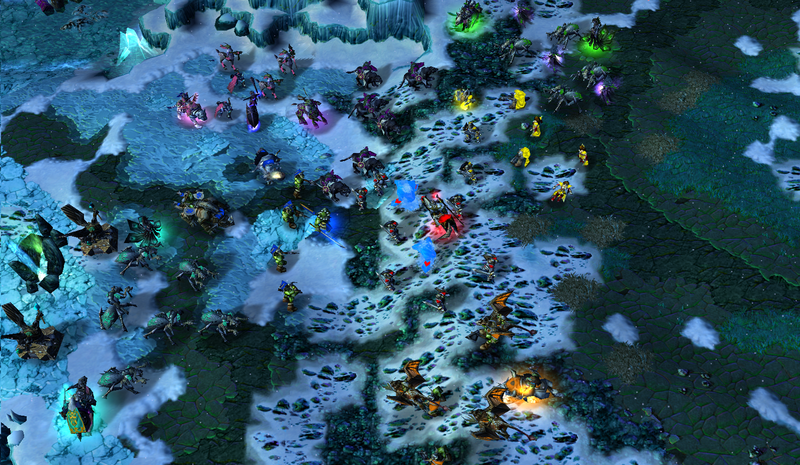 All ressources are natives to warcraft3 the frozen throne. Thanks to BaronVonSG, twitch caster from the WC3 GYM clan, who helped by testing the map and giving pertinent feedback. Thanks to Ragnaros17, mafe and mmtt for their help and comments on the hive during the map creation process. 08th of January 2019 - Creation of this page. Damn you made a very cool and explanatory spreadsheet. I'm impressed. Map looks complex and huge. Very cool looking.